The first step was to pry open the pit (actually just a husk) to get the seed inside. The internet kept saying it would look like a giant lima bean, but mine was more mollusk-like. The next step was to stick it in some dirt, keep it warm and moist, and wait a few weeks. 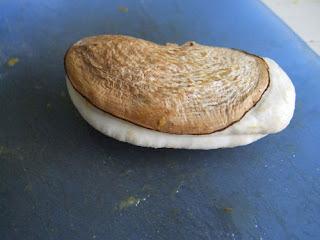 I heard some people say that overripe mangoes sprout more quickly, so I'm hoping that the fact that mine looks like a clam oozing out of its shell is a good thing. I'm never going to get fruit or flowers off of it--not in Minnesota--and to be honest I don't even know what a mango tree/houseplant looks like, but that doesn't matter a whole lot. I just need to indulge my urge to stick stuff in dirt and see if it grows. I'll post more pictures if I get a sprout.